Retractable Blinds have many benefits, but their first impression is the style that they bring to your home in Melbourne. Retractable Blinds have many benefits, but their first impression is the style that they bring to your home in Melbourne. External blinds are available in a wide variety of styles and operation, from a gearbox or motor operation to a sprung loaded top tube with a rope and pulley or a pull stick system. A motorised blind can also be fitted with a sensor or radio controlled. When fitting retractable blinds in an upstairs application, a rope and pulley system operated from the inside or a motorised option are available. Imagine pushing a button or flipping a switch and watching as your exterior retractable blinds roll up and down to conveniently provide shade from the sun, privacy when you want it, or allow light to enter as you wish. If the sun hits the glass it will transfer that heat into the house even if the inside curtains or blinds are closed, so preventing the sun’s rays from reaching the glass with external blinds is the best solution. 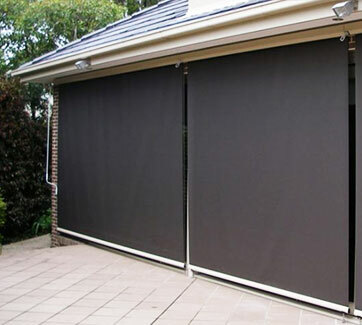 As well as the cooling effect, external blinds also protect the interior of your home from the sun’s harmful UV rays that can damage curtains, furnishings and fade the wooden flooring of your Melbourne home. External blinds also help reduce your energy costs and carbon footprint, as cooling from your air conditioner will be minimal. Retractable blinds are custom made and come in various designs, shapes & sizes. Components come in anodised, powder coated or stainless steel arms and weather box. The arms come in different lengths that enable you to still use your windows. Add a range of different types of operation and a wide variety of fabrics and colours, there’s a retractable blind to suit any application. 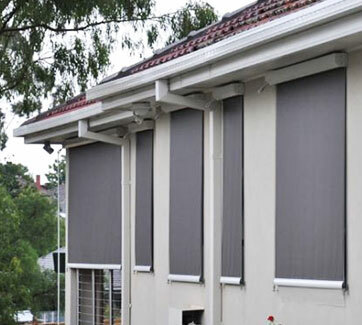 For more information or to discuss your special needs, just email or telephone and one of our friendly staff can arrange to meet with you for a free no obligation measure and quote for your external blinds in Melbourne - or go to our contact us page.